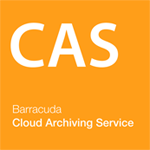 The Barracuda Cloud Archiving Service provides secure cloud-based archiving, enabling organizations to meet demanding compliance requirements and address eDiscovery requests easily and effectively. Ideal for use with services such as Office 365 and G Suite, it uses the Barracuda Cloud to store data for as long as needed without risk of amendment or deletion. End user productivity is increased due to accessibility to every message ever sent or received from any device. Barracuda Cloud Archiving Service provides extensive search and discovery capabilities, and can apply legal holds to selected data on an individual case-by-case basis, outside the operational environment on a separate secure archive copy of the data. This best practice ensures there is no conflict between data retention for operational compliance and legal hold for search and discovery exercises. As a result it is easy to demonstrate the accuracy and completeness of data returned for each case, and to provide the chain of custody for that data. Developed with end user productivity in mind, Barracuda Cloud Archiving Service includes integration with Microsoft Outlook on Windows, and native applications for MacOS, iOS, and Android, which allow for read only access to search and retrieve email at any time from any device. The Barracuda Cloud Archiving Service retains email outside the production environment in a dedicated and secure immutable store, with granular retention policies ensuring that original data is kept for as long as needed without risk of amendment or deletion. Role-based security controls ensure that only authorised personnel have access to data within the archive, while comprehensive audit trails make compliance easy to demonstrate. Whether you host your own Exchange mail server or use Office 365, adding a subscription to the Barracuda Cloud Archiving Service is the easiest path to protecting sensitive business communication and meeting email compliance requirements. With Barracuda, compliance is easy to demonstrate, and end users can have read only access to search and retrieve archived email at any time from any device. Archiving and compliance solutions from Barracuda take a policy-based approach to meeting this need, automating and enforcing both the retention and the deletion of email as required. With Barracuda Cloud Archiving Service, you save only what is needed and only for the time that it needs to be saved, and you can be confident that your day‑to‑day email operations meet government and regulatory compliance standards. In response to regulatory audits, you can demonstrate adherence to retention and defensible deletion policies. Besides archiving emails, Barracuda Cloud Archiving Service also provides an added layer of legal protection to your emails. For example, you can apply legal holds to selected data on an individual case-by-case basis. Protected emails are kept secure in a tamper-proof archive that is separate from your operational mail server. This ensures there is no conflict between data retention for operational compliance and legal hold for search and discovery exercises. As a result, it is easy to demonstrate the accuracy and completeness of data returned for each case, and to provide the chain of custody for that data. The Barracuda Cloud Archiving Service is 100% cloud-based with no hardware or software installation is required, and the cost-effective, per user pricing allows organizations to purchase only what they need. The Barracuda Cloud Archiving Service assists organizations with compliance and eDiscovery requests effectively and easily when used with Microsoft Exchange, Microsoft Office 365, and other on-premises, cloud or hybrid environments. It offers productivity features, including mobile applications for end users to search and retrieve email at any time from any device. Barracuda Cloud Control lets you configure, manage and monitor your email archive, backups and security roles from a simple web interface. The Barracuda Cloud Control extends beyond just the Cloud Archiving Service to provide you a single console to manage all of your Barracuda products and services including on-premises appliances. 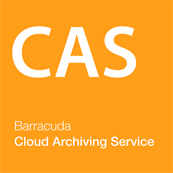 The Barracuda Cloud Archiving Service creates an indexed archive to support extensive search, auditing/permissions, legal hold and export, helping facilitate eDiscovery and retention. These easy-to-use search capabilities, ranging from the most basic search by a user for a misplaced email to advanced Boolean search strategies for an auditor during an eDiscovery request. Creates a cloud-based indexed archive. This allows granular retention policies, extensive search, auditing/permissions, legal hold and export, helping to facilitate compliance retention and eDiscovery preservation. Legal holds preserve email from being tampered with until it's removed. Native and mobile apps provide intuitive interfaces that ensure messages are found easily. The Barracuda Cloud Archiving Service includes a full 90-day version of PST Enterprise which automates the process of migrating emails from countless, disparate PST files into your Office 365 mail store. With PST Enterprise, you can systematically discover PST files throughout their organization and then automatically determine and assign PST ownership - even if the PST is password protected. Ownership can also be unassigned in the event the employee has left the company. 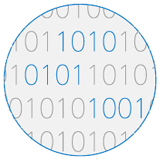 Once discovered, data can be imported or deleted by age, in place, or migrated into Barracuda Cloud archive. Finally, administrators can automatically delete PST files. Once all PSTs have been imported, PST Enterprise for Cloud Archiving Service can disable the ability for PSTs to be created. The Barracuda Cloud Archiving Service offers organizations a powerful Microsoft Outlook Add-in that gives end users easy access to archived mail. Mobile applications for Android and iOS devices, allow users to use their mobile device to search, download, and respond to any email ever sent or received, even if deleted from the server. Because all email is indexed, search is often much faster than typical native mobile email applications and provides a much higher search success rate. Users can forward emails, reply to emails or resend email to themselves. Barracuda Cloud Archiving Service provides organizations with the ability to archive instant message (IM) conversations, conferences and other content from both the on-premises and online Office 365 versions of Lync and Skype for Business. IM content is kept securely alongside other archived enabling organizations to meet their compliance, eDiscovery, and storage management requirements. The Barracuda Cloud Archiving Service stores archived email in a standard email format, so organizations can easily export the stored archived data to PST or .eml format. The desired content can also be forwarded to an Exchange server.